Make your next holiday party extra special by serving one or more of these healthy yet crowd pleasing appetizers. Heat oven to 375°F. Slit dates on one side and remove pits. Place ground nuts on a small plate. Stuff each date with 1/2 teaspoon goat cheese. Dip slit side of dates in ground nuts to coat the cheese. Place on a cookie sheet, slit side up, and bake about 12 minutes, or until dates are hot and cheese is soft. Let stand a few minutes before serving. Drain and rinse almonds. Place all ingredients in a food processor and pulse until mixed but not puréed. Serve with crackers or veggies. Preheat oven to 325 degrees. Place butter on a large rimmed baking sheet and place pan in oven to melt butter (about 7 minutes). Meanwhile, beat egg whites with salt until frothy; gradually add sugar, beating into stiff peaks. Gently fold in almonds and cinnamon. Pour almond mixture onto pan; toss with butter. Bake about 40 minutes, tossing every 10 minutes, until almonds are crisp. Serve warm or at room temperature. Store cooled almonds in airtight container up to 2 weeks. Preheat oven to 350 degrees. Remove the ribs from the kale leaves. 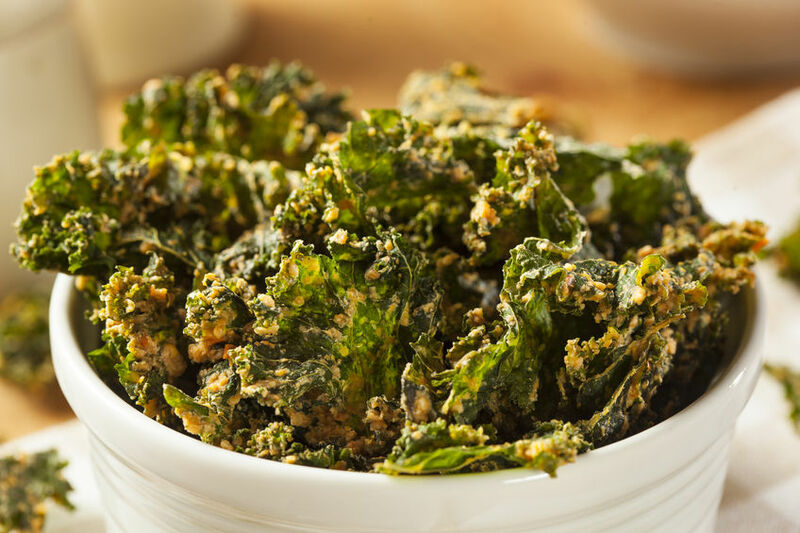 Cut kale leaves into 1 1/2-inch pieces. Place in a bowl and toss with the olive oil and salt to evenly coat. Lay on baking sheets in a single layer. Bake until crisp, turning the leaves halfway through, about 15 minutes. Pulse collard greens and shallot in food processor until finely chopped. Heat oil in large skillet over medium heat. Add collard mixture and garlic, about 10 minutes, or until collards have shrunk and are tender, and most of liquid has evaporated. Stir in feta cheese, season with salt and pepper and set aside to cool. Preheat oven to 350°F. Coat baking sheet with cooking spray, or line with parchment paper. Place 1 phyllo sheet with long side closest to you on clean work surface; cover remaining phyllo sheets with damp kitchen towel to prevent drying. Brush phyllo sheet with oil. Stack 2 more phyllo sheets on top, brushing each with oil. Cut phyllo stack lengthwise into 4 strips. Spoon 1 tablespoon collard mixture 1/2 inch from a short end of 1 phyllo strip. Fold upper corner over filling to make a triangle. Continue folding triangle onto itself, across, and down to make triangle packet. Transfer to prepared baking sheet. Repeat with remaining phyllo strips, then repeat entire process with remaining phyllo sheets and collard mixture. Brush triangles with oil. Bake 15 to 18 minutes, or until golden brown. Preheat oven to 450 degrees. Whisk together the eggs, half the cheese, bacon, if using, and salt and pepper to taste. In a medium cast iron skillet, heat butter over medium heat and swirl to coat the sides of the pan. Pour in egg mixture. While it cooks, 1 to 2 minutes until edge is set, arrange apples on top in a circular pattern, starting from the outside edge, and sprinkle with remaining cheese. Place skillet in oven. Bake until frittata is set in the center and cheese is browned, about 15 – 20 minutes. Loosen edges with a spatula and release frittata onto a cutting board. Cut into wedges. Serve hot. Gently heat agave, nut butter, vanilla, and sea salt in a saucepan. Stir until it starts to lightly bubble. Remove mixture from heat and combine with quinoa puffs and apricots in a bowl. Make sure the cereal is completely coated. Place mixture into a greased 8 inch square cake pan and press to form an even layer. Refrigerate for 30 minutes before cutting.